The eRacks/OPTERNATOR64 is an AMD® Opteron™ 6300-series Quad-processor system in a 2U & 1U chassis and it supports up to 64 core processor in Quad sockets with up to 1TB DDR3 1600MHz ECC Registered DIMM in 32 DIMM sockets. The starter config is with 8 (1 x 8)-core AMD® Opteron™ 6366 HE 1.8 GHz Processors along with 2 X 8 GB DDR3 ECC Registered RAM and 2x 500GB 7200 RPM Removable Hot-swap SATA3 Hard Drives. AMD writes: "The industry's only 8- and 12-core server processors performing at up to two times the level of AMD's previous generation 6-core processors, including an 88 percent increase in integer performance and a 119 percent increase in floating point performance." AMD has also implemented deeper sleep states, support for low voltage memory modules, and improved monitoring systems to keep power usage in check. 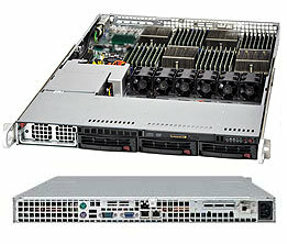 Taking AMD’s research reports in thought, OPTERNATOR64 series servers are designed as high-performance systems to underpin the products roadmap for the next few generations. It has six hot-swap SATA3 / SAS hard drives and supports both 32- and 64-bit Operating Systems. AMD® 6300 series processor supports up to 4 CPU sockets and 16 cores per socket, and are based on enterprise-level platform, yet are at a price-point also accessible to the SMB and individual markets as well. The eRacks/OPTERNATOR64 series servers are ideal for enterprise-level IT, hosting, and cloud infrastructure, delivering outstanding price for performance. Servers based on the AMD Opteron™ processors can empower IT organizations of all sizes by providing platforms that support their workloads while helping lower their total cost of ownership (TCO). For orders with over 64 GB memory, or custom system builds, please contact us for special pricing. We offer a full warranty, and custom configuration of your systems on request. Note: Use the Quote request button, eMail us, use the contact form, or call us for a custom quote, or simply write in your request in the ‘Notes’ field when you place your order. • 2U-height Chassis, 27.9 in depth (709mm), Weight 69 lbs. (31.3 kg). • Redundant 1400W high-efficiency power supply with PMBus. • Quad-AMD Opteron™ 6000 series processors 16/12/8/4-Core ready motherboard. • 4 x 8-core AMD Opteron-6366HE 1.8 GHz Processors. • 2 X 8 GB DDR3 ECC Registered SDRAM. • 2 X 500GB 7200rpm Removable Hot-swap SATA3 Hard Drives. • Dual-port GbE, 7x USB 2.0, 1 x IPMI 2.0. 6x SATA2.0 (3Gb/s) Ports. • 2 RJ45 LAN ports, 1x VGA port, 1x Fast UART 16550 serial port. • Ubuntu Linux Server plus Ubuntu Advantage Essential 1 year, or another open source OS. • Support both 1U-height Chassis & 2U-height Chassis. • Quad AMD Opteron™ 6000 series processors 16/12/8/4-Core ready motherboard. • Supports Quad AMD Opteron® 6000 series processors with HT3.0 Link. • Support up to 1TB DDR3 Registered ECC 1866/1600/1333/1066 SDRAM memory in 32 DIMMs. • 6x SATA2 (3.0 Gbps) ports via AMD SP5100 Controller; RAID 0, 1, 10. • Integrated LSI 2008 SAS2 Controller, Eight Serial Attached SCSI (SAS) ports. • 8x 6Gbps SAS / SATA ports, RAID 5 support (Optional). • LSI 2008 8-Port 6 Gbps SAS Controller; RAID 0, 1, 10; RAID 5 optional. • SAS HDD Backplane with SES2. • 6x heavy-duty counter-rotating PWM fans with optimal fan speed control for system Cooling. • 1 x double-width full-height/length GPU cards supported. • 1 x PCI-e Gen 2.0 x16 slots; 1x low-profile PCI-e x8 Gen 2.0 in x16 slot (accommodates AOCs up to 6" in length).